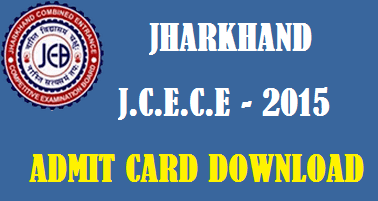 JCECE 2015 Admit Card for Entrance Examination conducted by JCECEB, Jharkhand. Jharkhand Combined Entrance Competitive Examination Board (JCECEB) is issued Notification for Conduct of JCECE 2015 Jarkhand Combined Entrance Competitive Examination (JCECE 2015) for admission into 1st Year B.E., B.Tech, MBBS, BDS, Agriculture, Forestry, Homeopathy Degree Courses for the academic year 2015-2016. Material to be brought on the day of examination Admit Card and Ball Point Pens of good quality. Rough Work All rough work is to be done in the Question Booklet only. The candidate will not do any rough work or put stray mark on the OMR Answer Sheet. Use of Blue/Black Ball Point Pen only for Writing of particulars on the Question Booklet and responses on the OMR Answer Sheet. PCM Group Subject are B. Tech. / B.Sc. Agriculture / B.Sc. Forestry. PCB Group subjects are M.B.B.S. / B.D.S. / B.Sc. Agriculture / B.Sc. Forestry / B.H.M.S. and PCMB Group subjects are B. Tech. / M.B.B.S. / B.D.S. / B.Sc. Agriculture / B.Sc. Forestry / B.H.M.S. Although in Online Payment mode, the payment is reconciled immediately. If due to some Technical problem your payment is not reconciled then it may be updated in next 24 hours. Still if it is not reconciled then you should call the help line. In case you have made Double Payment then your payment will be refunded as per "Refund / Cancellation Policy".